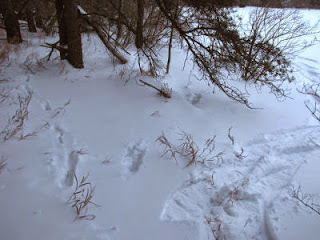 This post is several days late, and in the meantime I've begun to see deer and fox tracks again, but I was beginning to get a little worried after that cold snap. There were almost no fresh tracks for days. 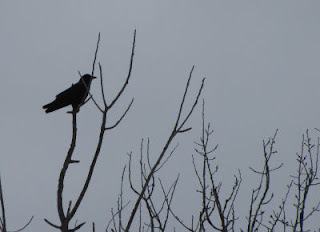 The one live thing I did see was the crow. Not exactly a spectacular sighting. I was pretty sure that the fox had a full tummy. There were tracks all over the 50 acres that I roam, and I saw three places like this where the canine went diving for small rodents. Hopefully he/she had good success. Maggie found a vole (something like a mouse, but with a short tail). She didn't kill this, but found it already dead and carried it home. I wonder if it was injured by the fox and later died. I doubt that it died of the cold. 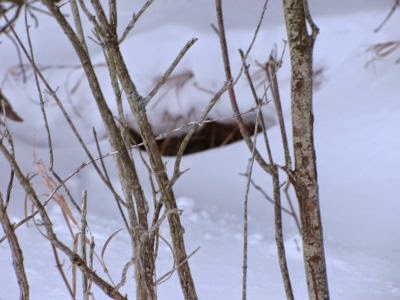 The little critters stay insulated under the snow, digging tunnels and munching bark off the shrubbery and grains from the dead grasses. I enhanced the contrast on this picture. One small furry folk had scuttled for a long distance over the surface, dove and then came back up just a short distance later. Today, finally, there were deer tracks all over, and some bunny trails too. We are on the northern edges of the huge winter storm that's headed up the Ohio Valley. Lin, Chuck, Ann, even Ratty, will probably be hit harder than I will. But, I hope all the animals have had a chance to get a good meal before they have to hunker down again. 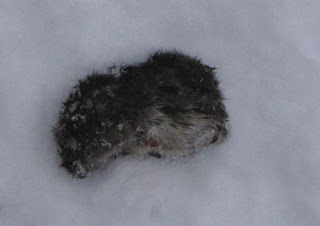 That's the one bad thing about winters with deep snow... it's tough on the wildlife. What is Om doing? It's an annual event here, but it usually happens slightly later in the year. It's still January! Did you know? (Probably, if you've been a reader for the past year or more.) 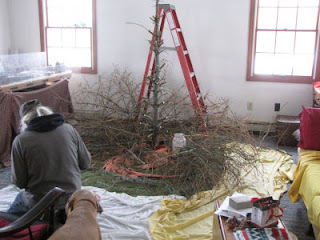 Surprisingly, there was one final blast of pungent, pine-y scent which lasted for an hour or more. The first of the two ponchos is done. In my effort to make the size larger than the one in the pattern I used, I overdid it a bit. This is large enough that I could wear it. But one beauty of ponchos is that they are very flexible, Anja is going to be a year older than last year (duh), and I'm not all that big. So I think it will be fine. It's prettier than the picture. I've taken numerous photos of this now, and I can not get the dark pink to show up properly. It looks red in the picture, but it's really a deep fuchsia with a little sparkle thread in it. Next, it's on to the one for Mia... colors a little different, and I'll scale the size of that one back. I'll publish the pattern on Shared Reviews when I get the second one done. 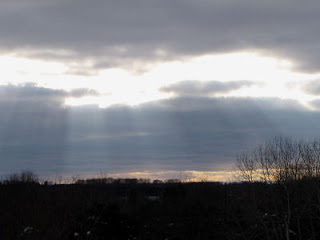 A bit of cold sunshine this afternoon, just to break the gray day. I'm going to take a completely different tack with this month's contest, but perhaps it will pull in some different contestants, and you don't have to write anything or use your imagination. Ivy, over at Spinning Lovely Days has recently announced that she is expecting. I first got interested in reading her blog because her daughter's name is Marguerite. It's not too common, and it was my grandmother's middle name. The more I got to know Ivy, the more I discovered that we have a lot of the same values, and even some of the same obsessions. She has recently announced that Marguerite is Going to Be a Big Sister. So, here is your mission! First, leave a comment for Ivy and her family on the post where she made the announcement. Then you must search the internet for FREE patterns for baby items, either knitted or crocheted- don't worry about the difficulty of the pattern. When you find one you like, send the URL to me at jhy@t-one.net. Keep in mind that she lives in the Philippines. 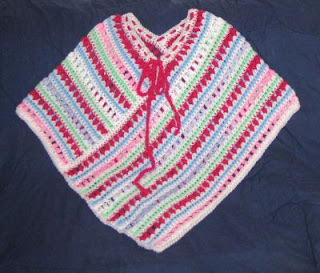 The baby probably won't need something like a Norwegian pullover! If this seems daunting, it's not really. Just search for free baby knit(or crochet) patterns in any search engine. 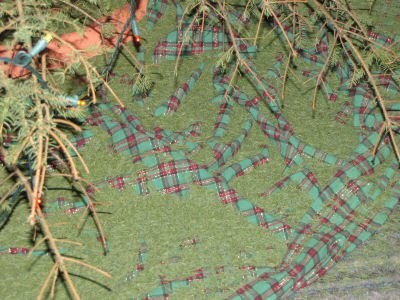 There are also some blogs that offer free classic patterns. Grandmother Wren is one of them, and she has an index. I'll pass the URLs to Ivy, without telling her who sent them. She will pick the one she'd like me to make, and the person who submitted it will be the winner. I think the only way you could go wrong here is that you need to make sure the pattern is FREE. I can't buy pattern and yarn and pay for shipping, all three. You may enter as many patterns as you like and each one will be an entry. But don't delay... entries are due by 11:59pm, EST, Monday January 31. What fun! I get a new project, and Ivy's new baby will get a gift. Ellen will deny this, but she's a much better skier than I am. 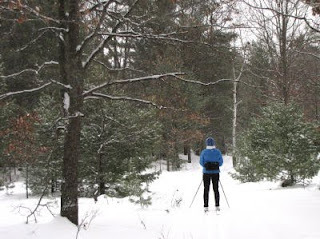 But I'm willing to do the easy trails, so we met this morning at Pentwater Pathway for some skiing. 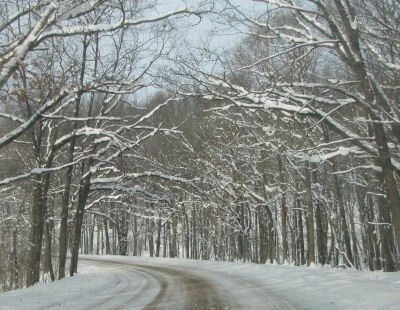 It's a beautiful set of loops within the Pere Marquette State Forest. 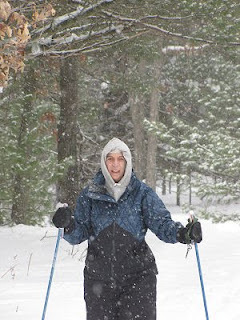 Ellen is really active with the Oceana County Cross-Country Ski Association, and they groom the trails. 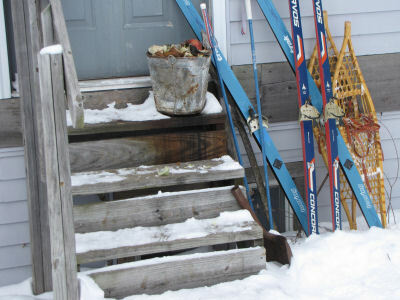 That's really great for the skiers, but it meant that Maggie couldn't go on this adventure. Sad for her. First we skied the easy yellow loop, but that took less than an hour, not quite as much time as we wanted to ski. But Ellen had a plan. She knew how to drive around to the back side of the area where we could access a large loop that is rated intermediate, but there's a nice long section that's very easy. So we skied that to a junction and then back to the car. Perfect! It was surprising that there were no fresh wildlife tracks at all. The weather is warm enough that I would have thought the critters would be out roaming for meals, but we didn't see anything. On the way home, I saw some ducks, but they were too far away to snap their portraits, so you'll have to settle for Ellen and me again. Come back tomorrow and find out what the game will be this time! I've been awarded the Stylish Blogger award simultaneously by Glynis of New Scribbles from Glynis Smy and Chuck at Secondary Roads, both long-time blogger buddies. We are supposed to tell 7 things about ourselves, and pass this along to 15 other blogs... preferably ones recently discovered. 2. In high school I had a TIA (a mini-stroke), and actually went blind for about three hours. It's the one health condition that I may be at high risk for. You can read some good Warning Signs of Stroke at Sir Rob's blog. 5. I'm a Fugitive junkie. David Janssen was the best. The remake was a loser. The movie with Harrison Ford (1993) was excellent! Can't count how many times I've watched it now... If anyone every bothers to psychoanalyze me, they can ponder why I'm so in love with the fugitive theme. And I'll almost admit to having a high school crush on David Janssen. I own some of the episodes, but that complete set is on my wish list. 6. I have the programs from every play I've attended post high school. I'd go to more if: a) I could afford it. b) I wasn't so addicted. 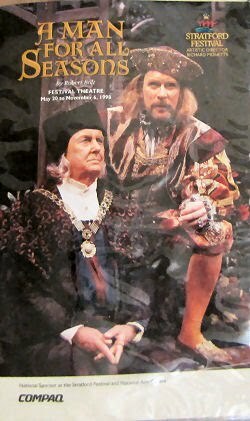 Plays are to me as drinking is to an alcoholic. Seriously... I get swallowed alive. 7. I finished my training today as a Field Data Collector for Mueller Services. I've been assigned to a manager, and will be given some real assignments beginning next week. Giving this award to other blogs. There is no way I'm going to come up with 15 choices. Here are six excellent blogs that I've become familiar with since my last award. 1. Ann's Scrap and Edit. Ann has become a good blogger bud, but I don't think I've ever given her an award. She's crafty, and has a cute Westie named Duke. 2. Be a Lifesaver of Goodness. Sir Rob is in health care, and blogs about health issues and his new baby boy. 3. Some Assembly Required. John does photography and web design, and is very involved in the Dalmatian Rescue program. 4. Random Stream of Consciousness. Another John, loves outdoor pursuits, and plays in many places that are familiar to me. 5. Together With Dogs. Meet two boxers, Sisko and Juno, and their "mom" and "dad." Lots of good dog info and food for thought. 6. Fungal Threads. Casey is my newest blog discovery of interest. Lots of great outdoor pix. OK... that's all I can deal with, but I do hope you'll visit them. Fortunately only one of those words applies to me. If you can't tell which one, I can't help you. However, I have a newspaper column due by noon tomorrow, and I'm having serious word-crafting problems. Sorry... have to go work on that. The dead thing is waiting for someone else to work on it. P.S. We are having a regular heat wave. They just announced on the weather that we are at 30 degrees... the first time anywhere in Michigan has been that warm since Jan 1. I promised not to just do a snow picture today. 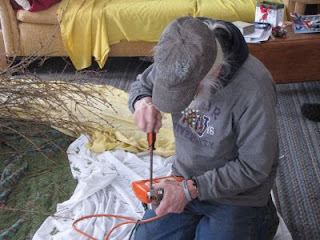 But I didn't see any wildlife, or have any great progress on projects, or cook anything wonderful (just a baked potato for dinner, and that's hardly earth-shaking!) So... what to do? I find some of the random-photo memes interesting, so I asked Om to pick a number between 1 and 15. I knew I had at least that many folders on my external hard drive. He picked 12. My twelfth folder was labeled "LPTC" for Lower Peninsula Trail Council. That would be the Trail Council for the North Country Trail Association. Actually, the councils are defunct, but I was the volunteer Chair, when it was operational. I had no idea what pictures might be in there. Turned out, there was just one... not 12, so I'll use the one. There you have it! Now, are you wondering what it is you have? 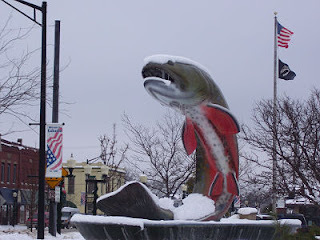 This is the Trout Fountain in Kalkaska, Michigan. 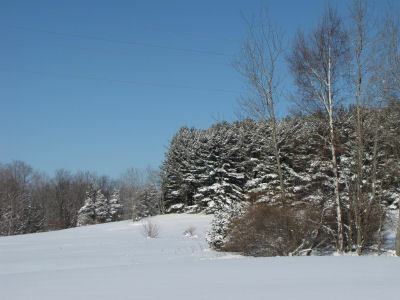 The North Country Trail skirts the town at present, but a section is being re-routed so that it will go through there- "trail towns" can be important to long-distance hikers. Kalkaska is home to the National Trout Festival, and this is an 18-foot brook trout- in celebration of the festival which was first held in 1936. I snapped its picture almost exactly two years ago, on January 21, 2009. This picture was taken at about 11 am yesterday. The mercury was hunkered down, but a soft blanket fell from the sky. A blanket about eight inches thick by the time it ended! But look at this amazing situation! 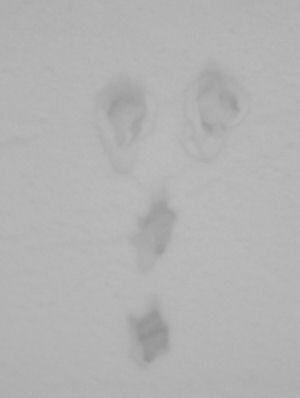 What's amazing is that this picture was taken this morning, and those are my snowshoe tracks from yesterday afternoon. The air was so calm that they were not smudged even a little bit by any hint of a breeze. That kind of calm is really unusual here. The overnight low here was -10 degrees Fahrenheit. Our coldest of this year, but not even close to the coldest in Michigan. Several places in both the Upper and Lower Peninsulas were -30 or colder, and one unofficial reading was -41! But look what a difference 24 hours makes. This was taken at 11 am today. It had warmed up to about 16 degrees above zero, and the sun was cheerful as Maggie and I took our walk. I was going to show you several pictures of today's snow. It came down in big, fluffy flakes all day, dampening every sound and shape. Temperatures are in the single digits, but very little wind, so it wasn't nasty outside. But something has also slowed our internet connection to a miserable crawl tonight. I'm having trouble even visiting my "regular" blogs. So I'll just load one picture for today... the view out the kitchen window. 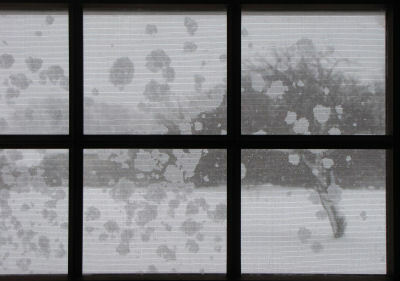 I always think it's interesting how the snow makes polka dots on the screen. Hopefully tomorrow it won't be such a hassle to play online. Today was a very busy day. The training for my job has kicked in for real and I've been doing training modules with online tests, and my first field tests. It takes a lot of time, but I also got my first paycheck yesterday, too. There's a lot to be said for that! I was able to pay a bill without gnashing my teeth and trying to figure out how to juggle $20 here or $50 there. I like it! In the evening, I went to a local event of the Ludington Arts Council called Story on Stage. Local writers whose stories were selected had their short stories read by local actors. Ellen urged me to go (she was there too), so I did. My reactions are mixed. Part of the problem is that audio input is my weakest sensory pathway. I have to work really hard to take in stories being read out loud. I also have to confess that I didn't care for three of the stories. They were all well-written... it wasn't that it was a low-quality "hick" production. They just weren't the kind of thing that appeals to me. One was a bleak tale of a failing marriage, one was about a guy who wants to kill himself, and one was the moment-by-moment angst of a mother waiting for the birth of her second baby- and her first one had died at birth. I've agreed to start going with Ellen to the local writer's support group and see how I like it. We'll see... I don't think I write the visceral kinds of stories that are considered sophisticated. Tonight didn't really encourage me. But, it's good to stretch. In other writing news, Accentuate Writers has finally announced the winners of the last three contests of 2010. Contests are being temporarily suspended in 2011 so they can get caught up with getting the books published. The three themes were Hope, Faith, and Gratitude. For the first time in the history of my entering these contests one of my stories didn't even make a "Digital Download." I can't complain... my overall track record is too good to be a sourpuss about that. Just for the record, the story that didn't win anything is on the Hope theme, and is called "Doru's Birthday Prayer." My Faith story is called "Ebeneezer," and it will be offered as a Digital Download. It takes a pretty traditional development of the Faith theme, but I kind of like it. My Gratitude story is called "Thank You," and it won a place in the anthology book "Expressions of Grace." This publishing all takes a LOT of time. The first of my stories that won anything was in November 2009, and that book may be actually available in February... at the earliest. 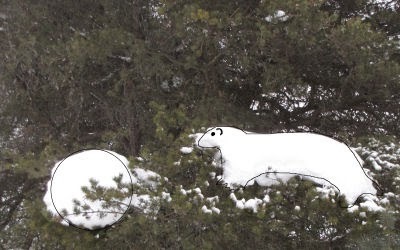 For wildlife it's always about finding something to eat and somewhere to stay warm/safe. In the winter, that's really all-consuming. Yesterday, the fox was looking for a meal. 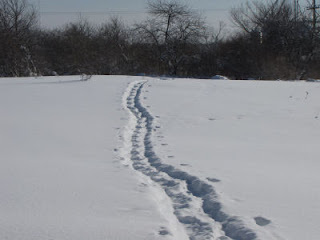 His/her tracks were no where near these, or there would have been a conflict of interest. As I stepped out the door yesterday morning, leading away from the house was this line of tracks. I could see that it was made by a bunny rabbit, and I know where it was headed, but you probably don't. I'll show you. 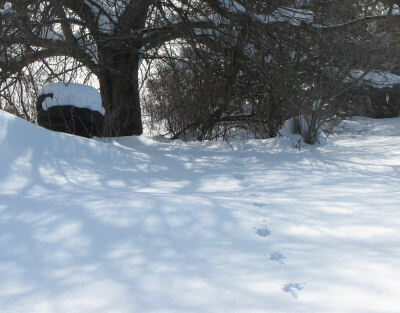 Under that tree is a stack of old tires which I use for my compost pile container. Any rabbit worth its salt will know that a compost pile is a great potential food source... wildlife dumpster diving. 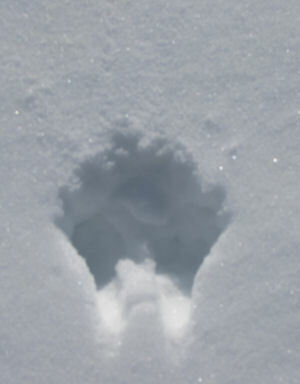 Just as a reminder, here's the ordinary pattern of rabbit tracks, if the rabbit is just casually hopping along. The two large back feet land side by side, ahead of the staggered, smaller front feet. 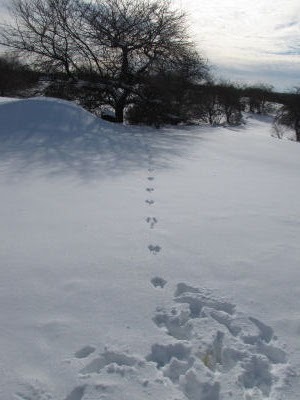 Although the pattern clearly said "rabbit," not all the tracks will look like those above. This set shows where bunny was sitting up on his back feet... look at those big, spread toes... kind of like snowshoes! ... it was having breakfast from the kitchen compost bucket! 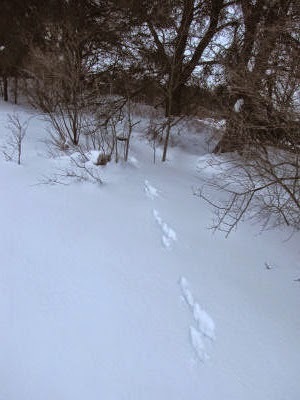 As Maggie and I were walking today I could see that the fox had been walking in the snowshoe tracks, probably earlier today, since yesterday the wind was wiping out any evidence of passers-by. 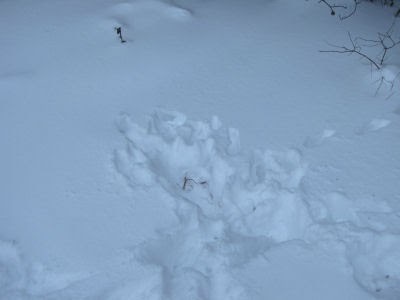 But at the point you see above, the fox tracks veered off through the unbroken snow. I wondered at the fact that the tracks just seem to end in that clump of shrubbery. I zoomed in. Wow! There was an opening just where the tracks ended! Had I found a place where the fox hides during the day? Even a den? Something didn't seem right about it. I went closer for a better look. Here I am on the other side of the bush, looking back. Confusing, isn't it. I stood here for a while. Here's what I decided. First of all, let's get oriented. You can see my snowshoe tracks in the lower right. The red arrow is pointing to the "hump" that is the top side of the opening where I thought the fox might have entered. Just above the tip of the red arrow is the last fox track that shows in the second picture. Now I looked at the tracks in the yellow circle. That's when I had to completely rethink my idea. The fox was traveling in the direction of the yellow arrow. So... I think it must have made a leap from the circle to the next track, and it just happened to be in front of that little opening. 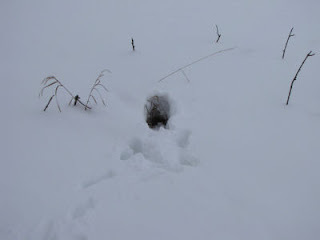 After I thought about it some more, I realized that the snow was not disturbed by the hole. Not at all. Not even a fox could be that "neat." The unmarked line of tracks near the left side of the picture was more degraded, and might have been made last night. 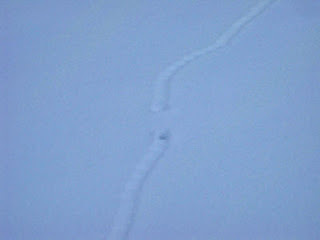 I followed the newer tracks farther and could see one of the things the fox had been doing. Although I didn't find any blood or bits of skin, I think the fox heard a mouse or vole under the snow and was digging for it. I saw no evidence that it caught it, or that it got away. But you can see there was pouncing and digging going on. So, since the fox was traveling toward me, I think I should have named this "Where the Fox Came From." See But is it Sylvia? Sea World in the Jack Pine? ... an amazing wildlife find for the Great Lakes Region. This visitor can only be explained as the first resident of a new water park. What? You can't find the playful seal? Let me help. Sometimes life curves away from us, ahead and behind, and we can't see where we are going... or maybe even recall where we have been. My life is a little bit like that right now. Thank you, friends who wanted this list... it has been quite instructive to me personally. I couldn't do it. I tried really hard. I couldn't believe how hard it was to pick my favorite posts of 2010. And, then, to choose only 10... nope, ain't happenin'. Anyway, only other (almost) OCD people will know the struggle... I mean, should I pick one of each topic: birds, colors, animals, writing, crafts, humor? Should I pick the ten with my favorite pictures, or with the best writing? Sigh... In the end the first eight were easy. Then I crossed off some others with a heavy hand, leaving these 15, in no particular order. You'll just have to speculate on which were the easy 8. That was interesting... I labeled them just now as I copied the links. Not a single craft thing made the list. Huh... Do we ever really know ourselves completely? What Are Those Goofy Pictures?